Hawick's Darcy Graham scores against Heriot's. Hawick’s mediocre start to the BT Premiership season continued yesterday as Heriot’s secured a 36-26 win at Goldenacre. On another day, the Greens might have salvaged something other than a try bonus-point; they certainly had enough possession in inviting areas, but indiscipline, basic errors and mental mistakes allowed the home side to hold out to take five important points. Graham Wilson opened the scoring for Heriot’s, finishing off a series of punishing pick-and-drive moves from his forward pack. The scrum-half added the conversion and doubled his tally moments later when Charlie Simpson took advantage of an understrength Hawick after Keith Davies was sin-binned for a professional foul. The winger breached a stretched Hawick defence for try number two. Up 14-0 and seemingly in control, Heriot’s took their foot off the gas and invited pressure. Wiaan Griebnow punished that generosity, scoring a skilful individual effort with a neat kick-and-chase effort that shocked the home support. Lee Armstrong added the conversion. 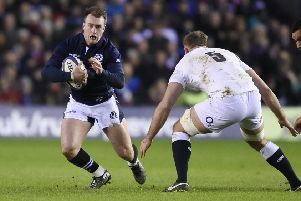 Wilson steadied a creaking Heriot’s ship, squeezing through a gap feet from the tryline, and also kicked the extra points. Hawick, however, had the final say in a very competitive opening 40 minutes when Darcy Graham intercepted a weak midfield pass and raced home to score. Armstrong converted as the half ended 21-14. After the interval, flanker Stuart Graham touched down for Hawick’s third try, Armstrong levelling the scores, but the former left the field later on a stretcher after receiving a serious-looking neck injury. Bruce McNeil became the second Hawick forward yellow-carded and, minutes later, Jason Hill scored try number four for Heriot’s from the base of a powerfully-driven scrum, with Wilson adding the conversion. Cameron Ferguson extended the home side’s lead before Hawick earned their try bonus-point through substitute Sean Goodfellow. There was still time for Wilson to add a late penalty and complete the 36-26 victory that moves the city side to the summit of the BT Premiership, while Hawick remain eighth. Hawick: A.Weir, D. Graham, W. Griebnow, J. Coutts, C. Russell, L. Armstrong, G. Cottrell, S. Muir, L. Gibson, N. Little, B. McNeil, C. Charters, S. Graham, R. Scott, K. Davies. Replacements: F. Renwick, M. Landels, F. Simpson, N. Mactaggart, S. Goodfellow. Hawick YM survived a late scare at Stewart’s-Melville before running out 45-35 winners to remain unbeaten in National Reserve League 2.